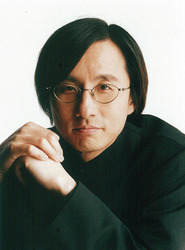 Kaoru Wada is a Japanese music composer, music arranger, conductor, music orchestrator and pianist. He has worked in a wide range of musical fields, including anime, film, television, theater, and video games. He has received numerous prizes for his work, including his music on the film Crest of Betrayal. Best known in the west for his work on Inuyasha and Samurai 7, he has also composed music for a number of other anime series, including Ghost Stories, Battle Angel, Princess Tutu, Saint Seiya, Ninja Scroll, D.Gray-man, Record of Lodoss War: Chronicles of the Heroic Knight, and Ace Attorney. In addition to his work as a composer, Wada-san also arranges music for several notable titles, including Kingdom Hearts I&II and Monster Hunter 4G. Along with these numerous activities, Wada has also published many works for Japanese indigenous instruments, plus works that use Japanese folklore and folk songs as motifs. He has published numerous works commissioned from Japan and abroad.